It is now common practice to cable major sports venues for broadcast operations. It saves time rigging pulling cables in to every camera and commentary position can take a day or more. The efficiency is great for broadcasters it means that the same truck can work at different grounds on consecutive days. As well as speed, pre-cabling also makes for a tidy rig. Stadiums are now prestige venues, and owners like to keep them looking their best. Draping cables around, using tape or ties to attach them to parts of the structure, which may not be designed to take loads, and covering cables in rubber mats leaving trip hazards are all unacceptable to stadium owners. TTL Video has been a leader in this area since 2000. That was when it was decided to pre-cable all the Premier League football grounds in England to a standard scanner location, and the contract was awarded to TTL. The initial project involved installing around 80 cables in each stadium. 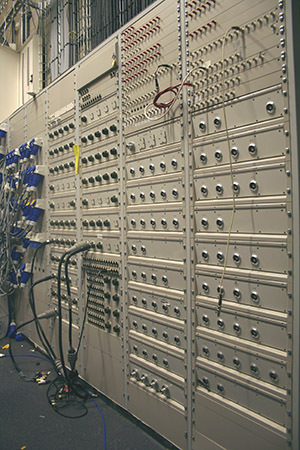 These included triax cables to the standard camera positions, plus audio multicores, video and power cables. Today the number of cables has risen to more than 300 for each stadium. This is due in part to the steady increase in the number of cameras around the pitch. The current standard Premier League plot can use 26 cameras. The cameras around the pitch are just the start. Broadcasters now expect to be able to put cameras on the arrival area, in the tunnel, in some sports maybe even the dressing rooms, and press conference rooms. There can be multiple rights-holding broadcasters at an event, each with their own presentation or studio, so the number ramps up really quickly. We see 80 or more camera positions alone specified in stadiums today. More broadcasters mean more requirements for commentary positions, audio feeds, data for telestrators and other requirements, too. We are seeing a transition of camera cables. At present the English stadiums are all still largely triax, but there is an increasing requirement for SMPTE fibre. This requirement started with high definition super slo-mo cameras, and was reinforced by the interest in 3D coverage, which relies on fibre cameras to give the necessary bandwidth. This is why we need good reliable suppliers of cables, connectors and accessories. Argosy, admirably, is one of our key suppliers and they help fulfil this role for us. For a broadcaster to decide not to rig its own cables, it has to be completely confident the stadium installation will work. That means the installation, and its routine maintenance, has to be to broadcast standards and broadcast reliability. 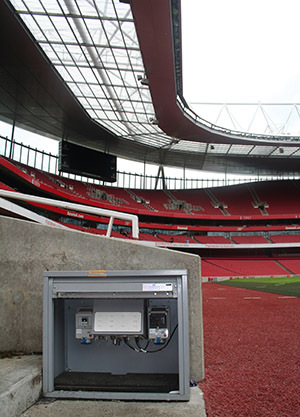 With the growing use of fibre optic cables both SMPTE fibre for cameras and single-mode, so-called dark fibre for other functionality we have a lot of experience in what can be done in stadium installations. When we started, fibre was felt to be relatively fragile for this sort of job, so we provided extra to give us resilience installing 12 strands where perhaps four were regularly used. But actually fibre has proved to be astonishingly reliable. The main problem with fibre are the connections, so when we are designing an installation we have to find the balance between the convenience of installing the cable and minimising, or eliminating, joins. The solution is to install fibre cables to the approximate length, then use short pig-tails with the connectors, which can be fusion spliced on site. Fusion splicing requires sophisticated equipment but is a relatively simple technique which competent wiremen can learn, and this means that fibres can be quickly repaired if necessary. We expected a typical life of five years but our installations are comfortably exceeding that. The cabling of stadiums and sports venues may seem like an unglamorous task, but broadcasters will only be able to trust it if they are completely confident in the infrastructure. In turn, broadcasters will be more keen to use a stadium which has a good infrastructure because of the savings in operational expenditure and time, so more events will go to that venue. All in all, a good, reliable, pre-cabled infrastructure is a sensible investment.